Thảo luận trong 'ENGLISH' bắt đầu bởi Olaf von Voss, 17/4/19 lúc 06:53. 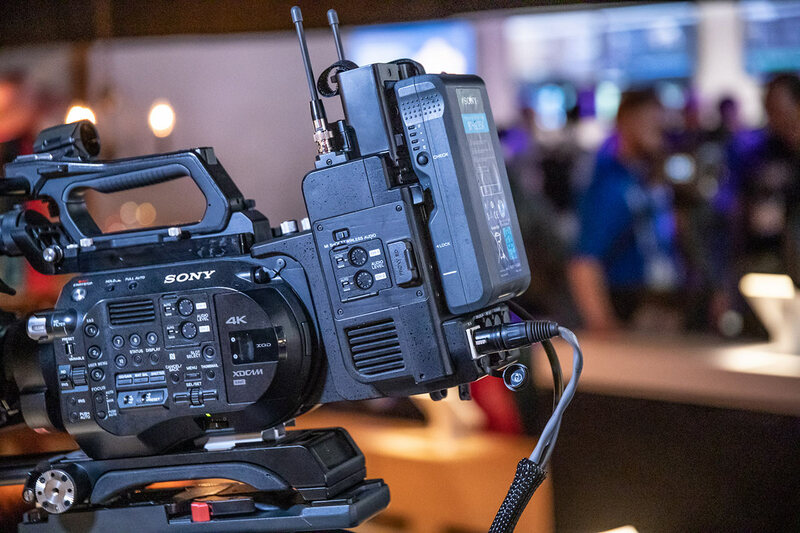 At this year’s NAB, Sony has introduced a build-up kit for their popular FS7 / FS7 II line of cameras. When combined with an optional B4 mount adapter, this unit transforms the already ergonomic cameras into ENG-style camcorders. The question is: why now? The Sony FS7 and FS7 II are very popular cameras, no doubt about it. If used with the optional (and also very popular) XDCA-FS7 extension unit for mounting a regular V-mount battery, the whole kit was already pretty balanced and ergonomically usable. And if that wasn’t for you, you probably would have rigged up your kit already to taste. But what if you want both a true s35 cinematic camera and the ergonomics and versatility of a classic ENG camcorder for documentary or news work? Well, Sony have a new kind of build-up kit ready. Now, there’s another option by Sony, which transforms your precious FS7 / FS7 II into a more ENG-oriented device. 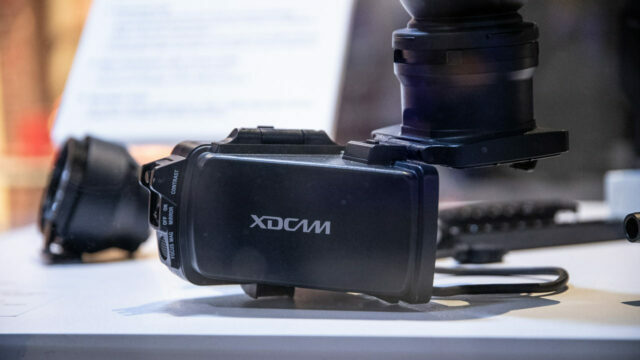 The device with the cryptic name Sony CBK-FS7BK looks like a bigger brother of the aforementioned XDCA-FS7 and it comes with extended features, a dedicated EVF and a new shoulder pad / plate. The popular Sony XDCA-FS7 extension unit offers timecode in/out, RAW out and accepts V-mount batteries. If you’re serious in fast-turnaround news gathering, the new CBK-FS7BK build-up kit might be for you, because it takes all the good stuff from the XDCA-FS7 but enhances its capabilities with the addition of a wireless audio receiver slot for compatibility with receivers, such as DWR series and URX series. Built-in networking enables streaming and file transfer via Wireless LAN or 4G/LTE connection. 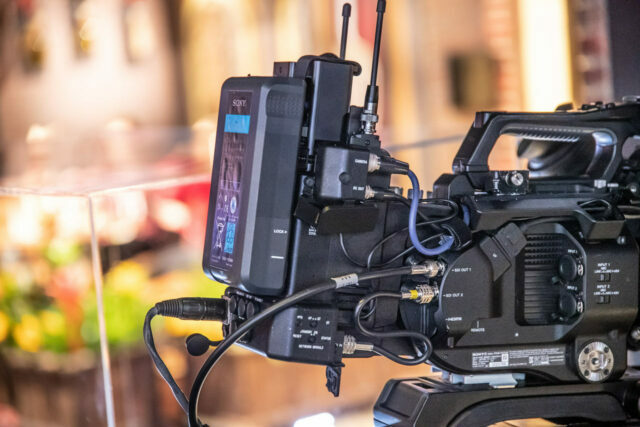 QoS Streaming with Dual Link connection (requires an optional XDCAM air subscription) improves image quality and stability via multiplexing of two cellular networks. The back of the extension unit offers the same connectivity as before, giving you timecode in/out, genlock, 12-bit RAW output (up to 240 fps) and a V-mount battery plate. A fully rigged FS7, ready for ENG use. You can also see the optional B4 mount. Furthermore, the kit includes a newly designed EVF which looks a lot more than the models found on Sonys’s big 2/3″ ENG cameras. The kit also comes with a newly designed shoulder pad, which ensures optimal weight balance when shooting without a tripod. You can actually slide the camera back and forth quite a bit, in order to find perfect balancing, depending on your setup. The CBK-FS7BK build-up kit won’t be available for purchase until December 2019, and it will cost around US$7.300 (6.500€). The LA-EB1 B4 mount adapter will cost you another US$5.600 (5.000€). That’s a pretty penny, when the FS7 II already costs around US$9.000 (8.100€). Maybe Sony’s build-up kit comes a little bit late to the party because, as I mentioned before, every FS7 /FS7 II shooter could have built their kit already… But then again, maybe this ENG-transformed FS7 might be the next big thing for broadcast productions. Personally, I have done quite a bit of broadcast shooting on a FS7 / FS7 II and it’s not always as fast as working with a classic XDCAM broadcast camera, for sure. Still, I’m not sure if the late arrival (and the price) justifies the investment. What do you think? Would you like to transform your FS7 / FS7 II into an ENG device? Share your thoughts in the comments below! 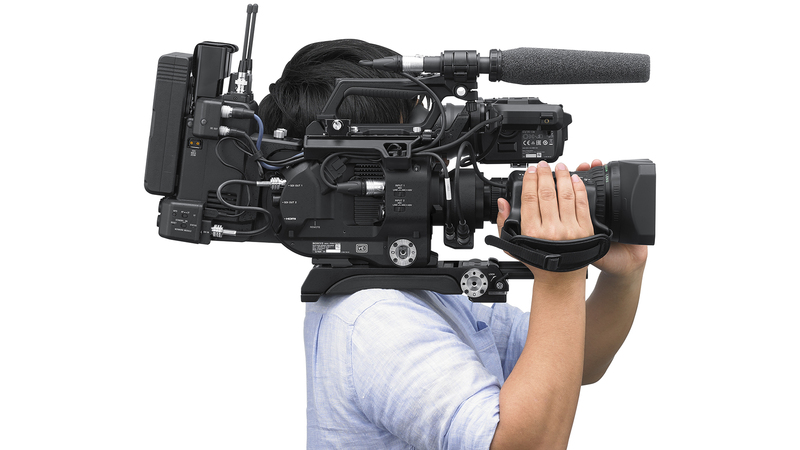 The post Sony FS7 / FS7 II Build-up Kit for ENG Use appeared first on cinema5D.